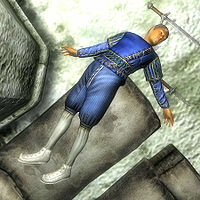 The Dead Scholar was an Altmer bard who was investigating a lost Ayleid settlement in Sideways Cave when he was killed by its new inhabitants. He seems to have been responsible for the "hasty translations" scrawled on three stone tablets that offer a glimpse into what happened to the settlement. He wears upper-class clothing consisting of blue silks, a blue silk shirt and the relatively-rare white mage's shoes. This page was last modified on 29 October 2012, at 22:19.